Nothing can be a better way for a bride to enter into eternal marital bliss than to say ‘I do’ with a gorgeous wedding bouquet in hand, because the love for flowers is indeed eternal. When it comes to wedding flowers for the bride’s bouquet, all you need is a unique blend of romance and tradition, with some touch of modernity. Secret Garden, being a leading wedding florist in Singapore, will offer you the perfect combination of wedding flowers for a bridal hand bouquet made up of mattiola, cream roses, peonies, alstromeria, freesia, and lots of other flowers as per your choice. If you are worried about arranging for the most appealing bridal bouquet in Singapore, let us help you out with the most appropriate floral arrangements, bringing in the expertise of our professional florists. There is absolutely no need to lose sleep over the quality of flowers or the timely delivery, just convey to us your requirements and we will definitely add a unique charm to your wedding décor, with beautiful wedding bouquets. 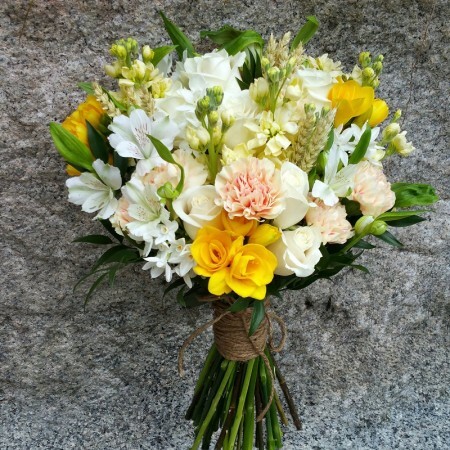 Selection of the bridal bouquet is one of the most significant aspects of the marriage, and contacting a reliable online florist for delivery of the wedding hand bouquet in Singapore makes things quite convenient. Order flowers online in Singapore from our exclusive collection, designed by expert florists. Be it wedding flowers or bridal bouquet, every designer package has an attractive coordinated look that fits with the theme of the occasion. Get your wedding flower delivery in Singapore now and add a personal floral touch to every wedding!